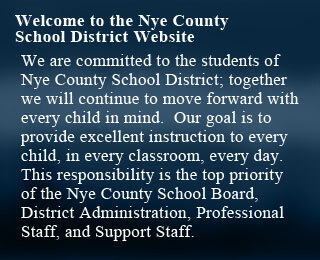 Innovative Education encompasses a variety of education programs offered by the Nye County School District. These programs all have one common link and that is that they are considered non-traditional education programs. Students in these programs receive instruction using an independent/assisted learning style. Pathways High School: Serving previously home schooled students, and students with medical problems which impede their ability to attend traditional school. Pathways Middle School: Serving previously home schooled students, and students with medical problems which impede their ability to attend traditional school. Adult Education: Provides an opportunity for students who are over the age of 17 and have never attained a high school diploma, the assistance to finish up their requirements for earning a their high school diploma. Counseling is also provided for students with career goals or who wish to go further with their educational goals. Program offers classes for English Secondary Language Learners. General Education Development (GED): Provides preparatory classes and course work for students over the age of 17 to prepare to take the General Educational Development (GED) test. Preparatory work for the (GED) is also available in Spanish. High School Alternative Education: Program is for students who wish to attend traditional school and are not able to earn credits because of enrolling late, or students who have had disciplinary problems or attendance problems at traditional school. Middle School Alternative Education: Program is for students who wish to attend traditional school, but have had disciplinary problems or attendance problems at traditional school. High School Credit Recovery: Provides opportunity for high school Juniors and Seniors to redo classes previously failed, so that they can meet credit requirements to graduate. Home School Liaison: Provides information to parents who may want to home school their students.